Just before we get into the meat of this lesson, let me clarify what this accounting term means. Accrued means ‘is/are owed’ or ‘payable’ or ‘owing’. Accrued income is thus income that is owing. "Owing to who?" you might ask. Well, who earned the income? Accrued income is thus income your business has earned, that is still owed to you. Now, how does income differ from the cash you get? Is there any difference between the sale itself (the income) and the cash received from a sale? Are they always the same amounts? As mentioned before, debtors are people that owe your business money. It also refers to the value of these debts as a whole. Debtors are assets, as you expect to receive benefits from them in the future – you expect to be paid. What happens if someone owes you money but you don’t expect them to pay you in future? Well, there are no benefits then, so this is not an asset. Another name for debtors is accounts receivable. The word "receivable" simply means "capable of being received," or "will be received." f)	George’s Catering provides catering services for a funeral for the Smiths. The services are provided on the 8th of April and the agreed fee is $5,000. As part of the agreement, the Smiths will only make payment at the end of April. What do we do with our accounting equation on the 8th of April? The accrual basis means that income and expenses are recorded in the periods to which they relate, and not necessarily when cash is received or paid. In this case, cash was received the following accounting period (year) in January. In spite of this, we recorded the income in this year, when it took place. The only other basis on which income and expenses could ever possibly be recorded is the cash basis. According to the cash basis, the income would have been recorded when the cash was finally received in January. No debtor (a credit item) would ever be recorded anywhere. Please note: We do not use the cash basis in accounting. We use the accrual basis. So, the question still remains to be answered: what do we do with our accounting equation on the 8th of April? The business has made income, and this is worth $5,000. 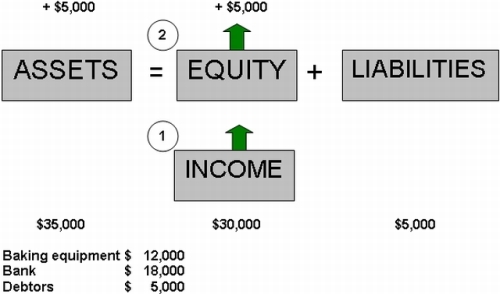 Income increases on the right side (the same side as the owner’s equity). The income is recorded straight away on the 8th of April, as the event has taken place (the catering services for the funeral has been provided). As the $5,000 is not received in cash on this date, we record a debtor (the Smiths). Our assets still go up by $5,000, but this is in the form of debtors - not cash - because this was a credit transaction. The owner now has a stake of $30,000 of the total assets of $35,000. Even though no cash was received yet, the income still results in more assets, and in the owner having a greater share of these assets. This lesson is by far the most difficult so far. So if you're not completely 100% yet, don't worry. IMPORTANT: Do not move forward if you're even a little confused. Instead, take a step back to the previous lesson entitled Define Income and go over the example in it. When you're happy with that lesson, return to this one and check it over again. If you're still having trouble, return to even earlier lessons you didn't feel good about, even things early on in the section on Basic Accounting Concepts. See if you can spot anything you didn't quite get the first time. Once you're relatively comfortable with the concepts we just went over, move ahead.